It is vital to keep dried herbs and spices free from airborne contamination; this is because they are particularly susceptible to airborne contamination from everyday items that are found within our homes. The result can be that our herbs, if smoked, or used in the kitchen, becoming tainted and having an unpleasant taste, which is why it is important to keep them in suitable airtight containers. 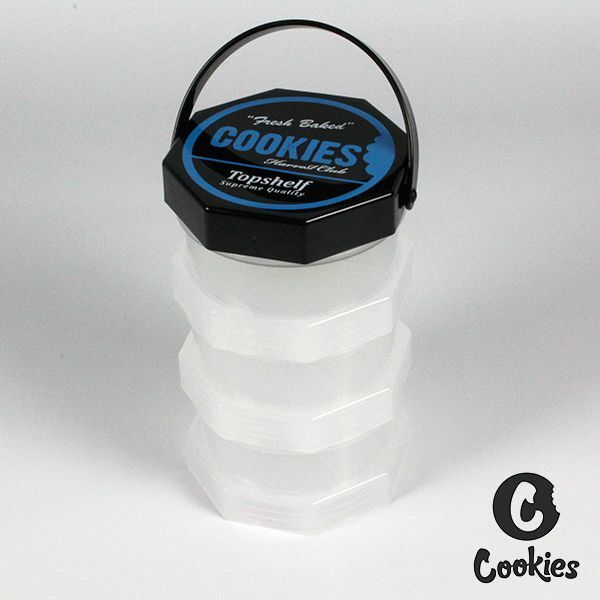 At our web pages a number of airtight containers can be seen, but the Cookies 3 Tier Stacked Storage Container is proving to be very popular and perfect for anybody looking for a storage facility for their Herbs and Spices. Comprising a set of three twistable, stackable jars that you can use to keep and separate your herbs and spices, with the option to either utilise the three jars or you can, if preferred, use the middle dividers and turn them into a four, five or six section storage facility. The storage containers can be easily separated, or they can be locked together with the top lid having a handle for easy carrying when out and about. Using a “twist seal” this ensures that your herbs or spices are kept in good condition ensuring absolute freshness. In their stacked format the containers are 2 3/8’”x 3 ¼” for a single unit, or staked together the measure up at 5 ¾” x 3 ¼” a neat solution to your storage problems. Offered in either clear or red, either colour is offered at just £14.99 and they will make a neat and practical addition to your kitchen or smoking den. Ask any chef, or even your Mum, they will tell you that there is nothing that can compare with using fresh herbs in culinary dishes. But, even they will have the to admit that culinary herbs stored in one of the Atomic Airtight Glass Storage Containers, and used in their dishes will be as good as the fresh ones that they have previously used. The very clever secret is that the a large proportion of air is removed from the jar after the herbs have been put into the jar, thanks to the innovative twin valve airflow system which forces the air out via the clever plunger style lid. Manufactured from high quality 4mm glass, the Atomic Airtight Glass Storage Jars are generous in size, each container measures 93 mm tall, 65 mm wide and has a diameter of 54 mm. They are offered by us in four attractive colours, Black, Blue Green or Red and priced at just £7.9 each, considerably cheaper than buying fresh herbs and throwing out the ones that are not used on the day. At this price a different coloured storage jar for the four most used herbs in your kitchen perhaps. This could be just what the doctor ordered, well it might be if you wanted to keep medication or prescription tablets handy, but in our case it is ideal for storing herbs and spices in one convenient pot. This will keep your herbs fresh, and the bonus is that it is child proof, so no prying fingers will delve into your herb store. Ideal for carrying herbs, spices, concentrates and other contents around with you, or to keep at home, once the safe lid is removed it can be turned over and it then makes a convenient place for you to roll a smoke from. The contents measurement is 30 drams, which is a pharmacy or “apothecary” unit, but it relates to 120ml, so plenty to carry around or take away on a weekend away. 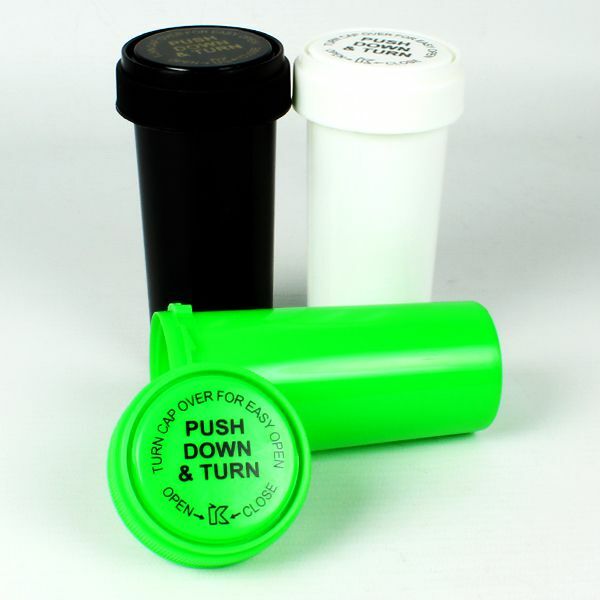 The Push ‘N’ Turn Vial is offered in black, white or green, with a unit cost of £1.75, but we can supply these at a reduced rate if a quantity of the pots is bought in a single transaction. 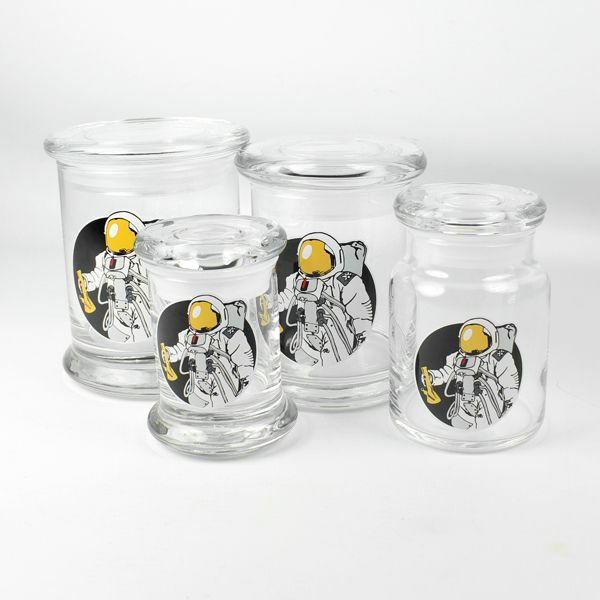 We can be sure that whatever you may have been smoking in your smoking pipe, chillum or bong, out in space there will be nobody that will be able to smell it, what is more, with this great 420 space man jar, no one will smell your herbal smoking blends when stored In them and they will always remain nice and fresh too. These jars first bust upon the scene at the last High Times Cannabis Cup 2006 and they are made from the very finest American glass, perfect for keeping your herbal smoking blends nice and fresh, plus these jars also make great display pieces. 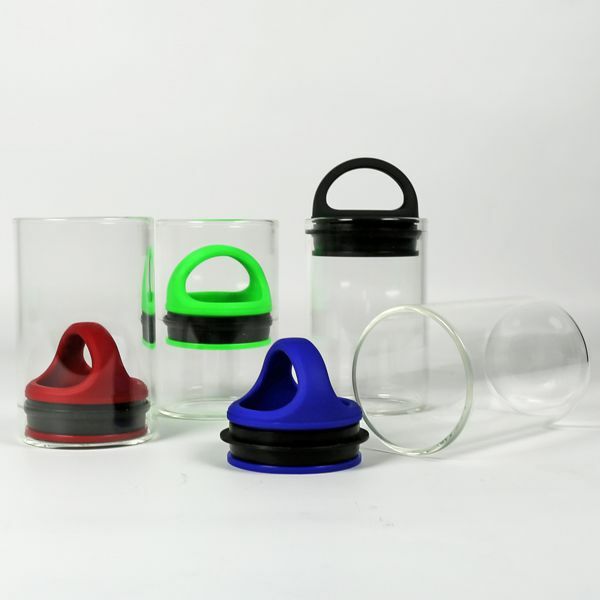 One of the main features is the Heavy Duty Pop Top lids and bases that seal in the freshness, you can check this out for yourself when you open them and hear the air vacuum pop when you open your jar. The jar features great designs, you do not need to worry, and they will not rub off because they are baked on during the manufacturing process. Offered in four sizes and with different designs, you can choose: X-Small: Height 8.25cm, Width 5.75cm, Holds 89ml or 4.75 grams, Small: 6.5cm x 8cm; 7grams, Medium: 7.5cm x 10cm; 10grams, Large: 9cm x 11cm; 16grams. Our price for these jars starts at just £9.99 for the X-Small size, in fact a small price to pay for the security of always having fresh herbal smoking blends when you pop the lid. Place two cups of coffee on the table, one which has been made with freshly ground beans and the other with those which have been in the cupboard or refrigerator stored in a bag for days, or heaven forbid weeks, and then take a taste from each cup, the difference you will find is quite marked. The same can be said for other products such as herbs which like coffee can attract moisture or smell, as well as accelerating the oxidation process. The Coffeevac’s which we are offering have a unique patented vacuum closure system, and the two way valve, uniquely allows the carbon dioxide from the beans to slowly escape, without letting oxygen in. 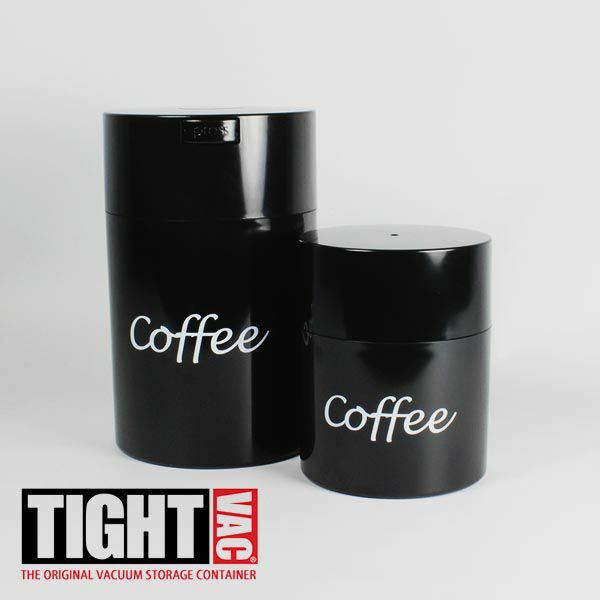 The clever valve closure system enables the CoffeeVac Airtight Container to be opened and closed quickly and easily, this then gives a totally airtight, water resistant and smells proof seal. Although the containers have the word coffee emblazoned on the front, there is no reason why many other items which will benefit for being stored in an airtight container cannot be kept in them, things such as tea, sugar, biscuits, kitchen herbs or anything you like! The large container on offer will hold up to 1.8 Litres or 500g, and the smaller of the two will hold up to 0.8 Litres or 250g. We are sure that once you have tried products which have been stored in these containers, you will not believe the difference that it can make. When you have obtained your extracts, the last thing that you want is for these to become tainted and the perfect way to store, or even transport these is to ensure that the container is of the highest quality, which is why we recommend Honeypots. These are made by Honeyworks, a British company, who specialise in making high grade silicone accessories for the use with extracted essential plant oils. They specialise in making silicone products of the highest possible quality, everything from little silicone pots, to silicone mats and even PTFE sheets. The large Honeyworks Honeypots are perfectly designed to fit into the pocket or bag when out and about; Honey Pots are the perfect accessory for every type of dabber. Importantly the pots are manufactured using only Platinum Cured, Medical Grade silicone referred to as UPS6, which unlike food grade silicone, the medical grade silicone material is completely free of by-products and is comprised only of pure silicone. So when you are ready all you have to do is to use a simple squeeze and release is all you need to snap the container away from the concentrate within, you can be assured that nothing will stick to the Honeypot. Each of the containers is a different colour, so you can have one for each of your flavours, the pots will hold up to 6 g of extract; don’t settle for cheap imitations, why spoil the precious extract, Honeyworks has no bad odours, smells or flavours that can affect the purity of your extract, all for just £18.99. The two sizes of Cheeky One stash pots are perfect whether you are going away for the weekend or just out for the day and allow taking your hash with you easy. Well-constructed, the stash pots themselves are available in a selection of colours, currently we are offering these in Red, Black and Silver. 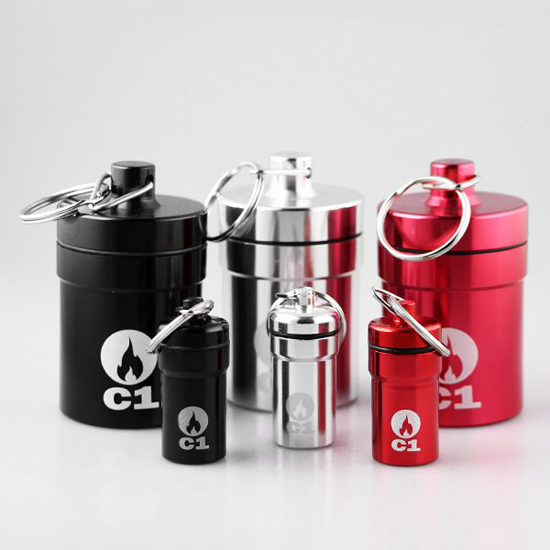 The lid comes complete with a rubber seal which is designed to prevent any smell from the stash pot and also it serves to keep the contents fresh and well protected. The inside of the stash pots has a removable lining of plastic which prevents the herbal mixture being contaminated by the metal. Both sizes of pot pots has a ring attached and the smaller is ideal for attaching to a key ring and the larger version can be carried in a bag when you are travelling, as you may find it too big to fit comfortably in your pocket. You will find that even the smaller of the two stash pots can hold plenty of herbal mixture, as much as a gram or so. Competitively priced at £4.99 for the smaller of the two and £7.99 for the larger, these stash pots will make an ideal present for someone, or even yourself of course. ROOR Airtight Glass Jar – what will you keep in them? Air tight storage jars are a great accessory to have to keep your herbs and spices fresh and ready to use just when you need them. 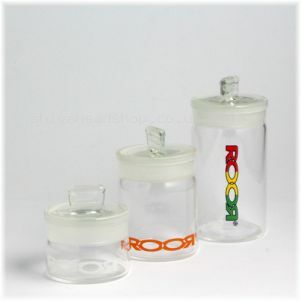 These ROOR Airtight Glass Jars are available in three different sizes, small (30 x 38 x 38mm), medium (45 x 38 x 38mm) and large (70 x 38 x 38mm), and are embossed with the famous ROOR logo. These storage jars are great for herbs, spices, tobacco and just about anything that you want to keep fresh; they also keep the smell in as well. Starting at just £15.99 each, ROOR Airtight Glass Jars are perfect for just about any home and are strong and durable enough to last a lifetime. Please note: Colours of the logo may vary from the picture below. 420 Pop Top Jars – great for storing just about anything! Air tight jars are handy for just about anything from tobacco to herbs and even to keep your precious items safe and secure. 420 Pop Top Jars are made in USA and feature thick glass walls and a vacuum sealed lid. 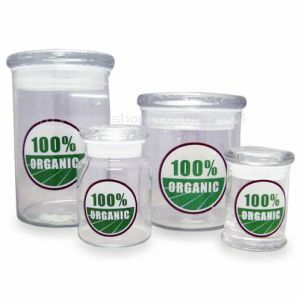 These jars are available in a range of different styles from ‘100% Organic’ to ‘Let’s Bake’ and start at just £9.99 each.